Stunning Red and White Wedding Cake Ideas - Click to See All!! Need inspiration for red and white wedding cake ideas? 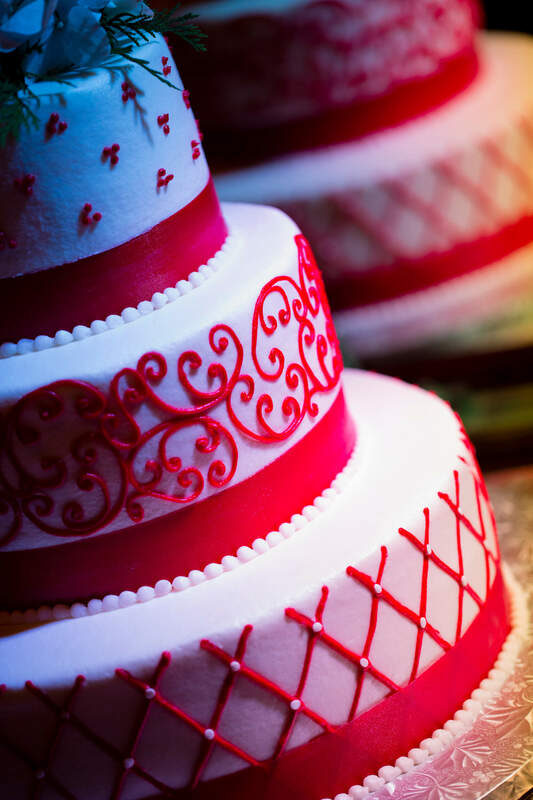 We’ve handpicked some of THE most gorgeous red and white wedding cakes from the most talented wedding cake designers in the wedding industry. Check out these stunning red and white wedding cake ideas! This three tier red and white wedding cake features a different style of decoration on each layer (tier) – perfect for the couple who just cant make up their mind 🙂 All kidding aside, its artistic and super-stylish, truly a stunning cake. Photo copyright 2012 by Garrett Hubbard Photography. This stunning classic red and white wedding cake with roses was designed by Boston Floral for a picturesque fall wedding in New England. An abundance of fresh roses cascade down the side of a basic 3 layer round layer wedding cake which scrumptious textured fondant icing. The top of the cake is crowned with a cluster of red roses from which the rose cascade flows. A whimsical red and white wedding cake, with flowers (roses made of fondant icing ), around the base of the cake for a splash of elegance and tradition. This red and white wedding cake was designed by Truly Custom Cakery. Another whimsical cake, this “half and half” red and white wedding cake by Cake Central is for the couple who doesn’t take themselves too seriously and wants their wedding cake to reflect a bit of their fun loving personality. Can’t decide between a red or white wedding cake? Then half and half is the way to go! Its unique and unexpected, and it’ll definitely get your guests talking! Trimmed with rhinestone crystal bands for a bit of bling, this cake mixes elegance along the way, so its not all just fun and games! 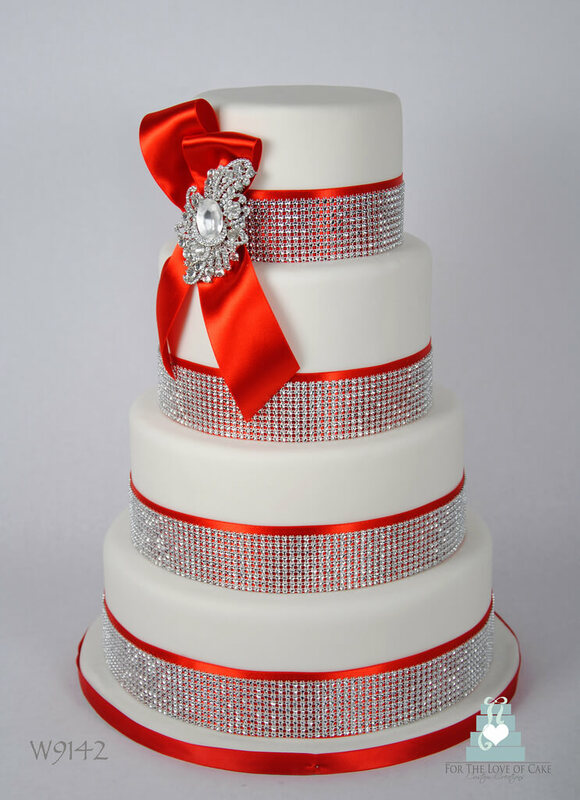 When a bit of bling is your thing, this red and white wedding cake with crystals designed by For the Love Of Cake For the Love Of Cake in Canada should satisfy your desire for something that sparkles. This cake is very similar to the half and half red and white wedding cake above – without the whimsical touch. This one is all elegance and sophisticated style, all the way. A nature lovers paradise – on a wedding cake! 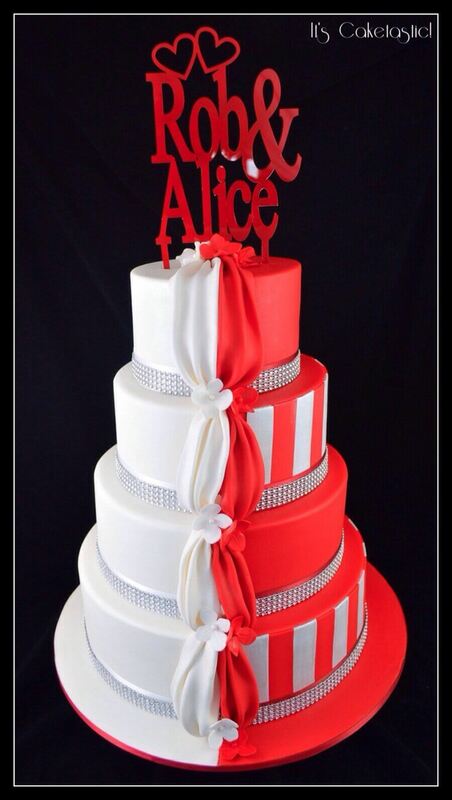 This incredibly detailed red and white wedding cake is a work of art if ever there was one. If you look closely you will see horses, squirrels, birds, bunnies and other assorted critters in among the flowers and butterflies. This cake was inspired a red and white china pattern, shown in the photo to the left of the cake. It shows you how inspiration for your wedding cake can come from just about anywhere. Look around you for ideas – they are everywhere. Now you simply to find a cake decorator with the talent and skill to bring them to life! 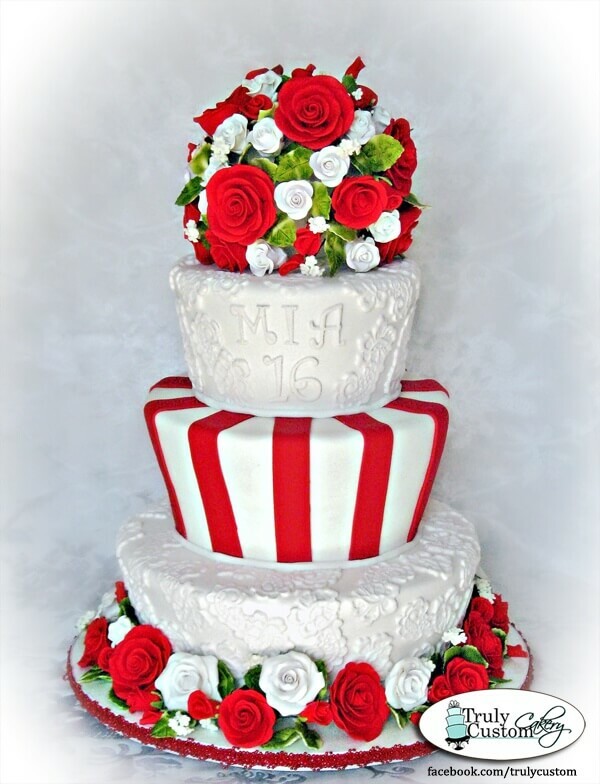 Red roses cascade down an otherwise simple white fondant three tier cake in a rush of understated elegance. 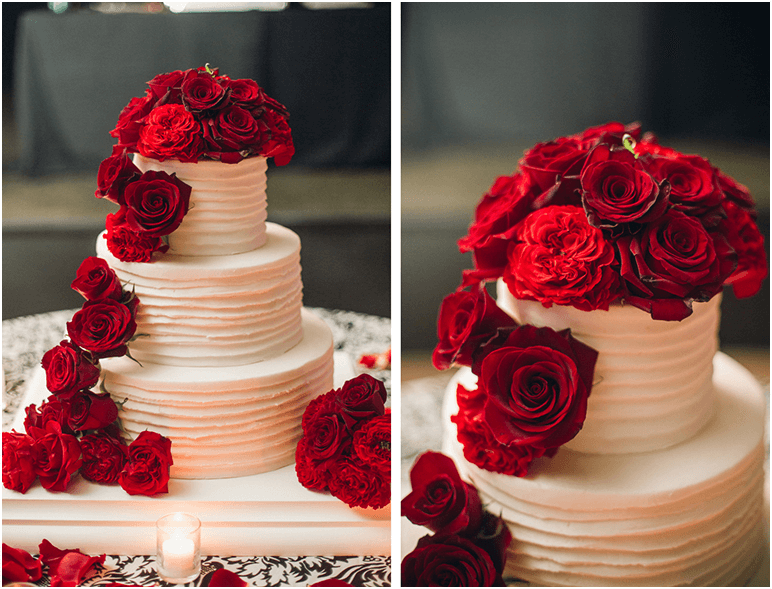 The red roses add a sense of romance and passion when contrasted against the white cake. For different but equally pleasing effects, any other accent color could be used in place of red. If you look closely, you’ll notice that the layers of this red and white wedding cake cake are actually heart-shaped, however, you could ask your cake designer to modify this design by using round layers for the wedding cake, if hearts aren’t your thing. The Cake Shop, in Ottawa, Canada designed this wedding cake.